I am catching up on some posts on this lazy Sunday. I have had a great weekend so far just relaxing, running, walking, and trying to stay warm after a week of stormy weather. This post features more output from my new camera (shrunken down for storage purposes). Last Friday, "The Ukrainian" and I went to Loving Hut for some dinner. I needed some fuel for a 17-miler the next morning. Just as some background, since "The Ukrainian" and I work for the same utility, we're usually in and out of work earlier than most people, work out in the late afternoon, and sometimes go out to eat afterward. The Loving Hut is vegan, which was surprising to me, since there aren't too many vegan places in my area. I don't order meat or tolerate dairy very well, so vegan places are a safe haven for me. I was excited to know that I could order anything on the menu and kept asking the waiter what I'm sure were annoying questions like, "Is this ice cream made with dairy?" I was so skeptical, and I had trouble deciding what to get! 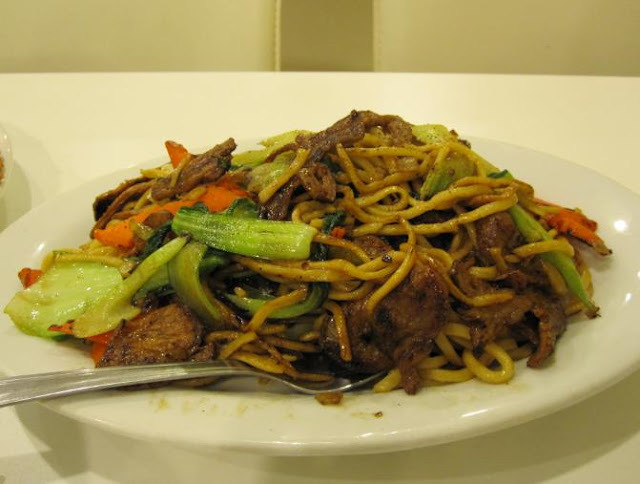 Above: "Beef" chow-mein. This was really good... they really maximized the wok flavor in these noodles. The "beef" was chewy and actually reminiscient of beef. I rarely eat beef substitutes, but this was rather good! Above: Ocean Basket. This came with fake fried shrimp, chicken, and fish. Not shown too well in this picture is some fake tartar sauce and sweet/sour dip. Neither of these were exactly like the "real thing," but they were passable. The french fries did not wow me, only because those are easily vegan, anyway! I liked the fake chicken the most, since the texture emulated the source the best. I didn't like the taste of the oil used, though. I think it was grape-seed or sunflower, and although I dig the attempt at healthiness, it kind of weirded me out a little. Also, most people would probably do better adding salt. 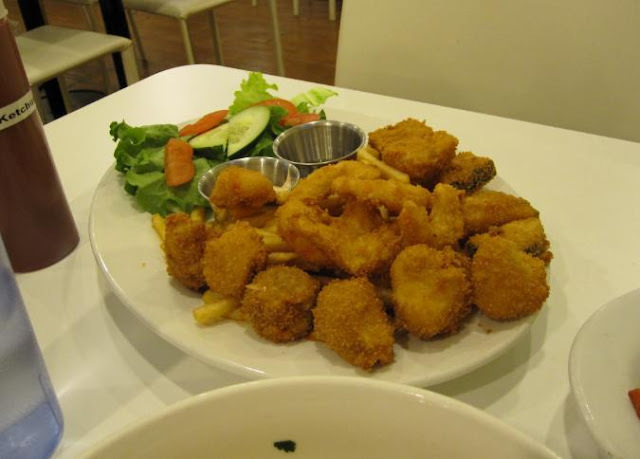 Overall, though, this got my fried-food fix out of the way for a little while! Above: Won-ton noodle soup. 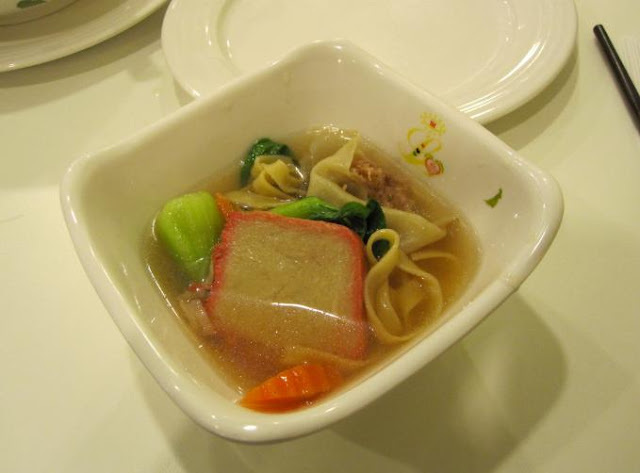 This came with egg-less noodles, a flavorful broth, fake-pork wontons, and fake char-siu (barbecued pork) slices. The char-siu was a little weird due to texture but was tasty. The noodles and soup were great, though, and the wontons were not too far off from the real things. I am often searching for non-meat dumplings, and this really got my craving out. Finally, dessert. I reviewed Real Food Daily a while back, and I must say that Loving Hut's desserts are a third of the price of RFD's. Besides that, I wasn't disappointed by LH's rendition of carrot cake. The middle layer definitely tasted cream-cheese-ish, though I learned not to try to sample each layer on its own. 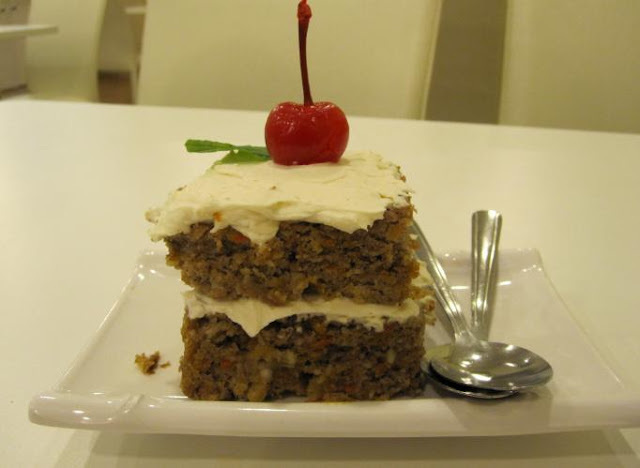 Really, to get the realistic effect of carrot cake, all layers should be included in each bite (same is true with RFD's desserts). All in all, we ordered too much food that had to be taken home. Anyway, my 17-miler went beautifully, and I'm wondering if it's because of this yummy vegan food. =) Either way, I will be back. I should mention that the meat-eating "Ukrainian" liked it as well. By the way, Loving Hut is a nation-wide chain, so maybe there's one in YOUR area to try??! I found out there is one here in the OC in Ladera Ranch. A bit of a drive for me but the food looks yummy!